With this article being the 100th posted on the Informed Illustrator, I thought it was high time we knew a little bit more regarding what we are all about. So I decided to research the single word that is most commonly used to describe what we do…illustration. I began by consulting four of the largest dictionaries of the English language. I also found some interesting examples of usage to accompany the definitions. time the word can be attributed to historians who described medieval manuscripts as having the ability to “light up” their texts. Illustration is derived from the Latin “illuminatus”. the usage of “illustration” from the year 1500 on, first within the American English corpus and then within the British English corpus. The main difference between the two occurs from 1500 and 1650. This is owing to the fact that the publishing industry in American did not become widely established until the mid-17th century. Data furnished by Googlebooks Ngram Viewer. also substantiates this by showing the most quotations of “illustration” in American English books appeared during this period than at any other point in the past 350-years. n. 1. a. the action of illustrating : as the condition of being illustrated. b. archaic: the action of making illustrious or honored or distinguished. 2. a. something that serves to illustrate: as an example or instance that helps make something clear. b. a picture or diagram that helps make something clear or attractive. n.1. a. The act of clarifying or explaining. b. The state of being clarified or explained. 2. Material used to clarify or explain. 3. Visual matter used to clarify or decorate a text. n 1. pictorial matter used to explain or decorate a text. 2. an example or demonstration: an illustration of his ability. 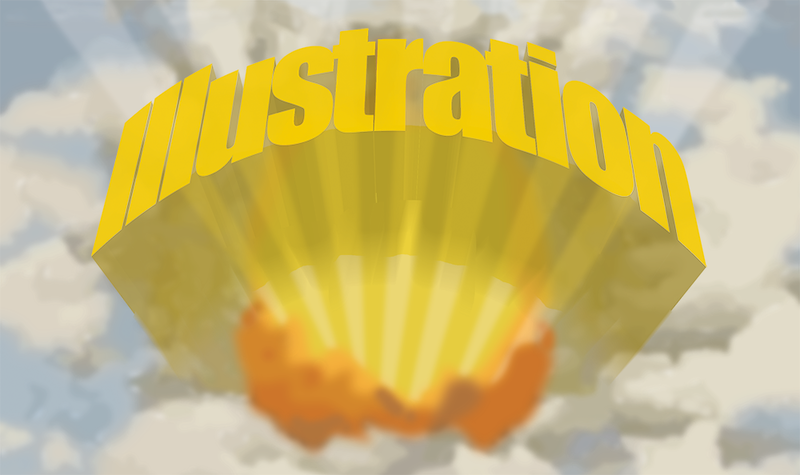 3. the act of illustrating or the state of being illustrated. n.1. something that illustrates, as a picture in a book or magazine. An illustration is a two- or three-dimensional pictorial image created to render, explain, elucidate, enhance, and call attention to an object, concept, description, expression, narrative, or a specific article described within by way of visual representation. A book with many photographs and illustrations. The illustrations he provided were very effective. This delay is a perfect illustration of why we need a new computer system. Examples are included, by way of illustration, to show the meaning more clearly.